I had planned to recap Agent Carter today, but I was unable to watch it in time so I'll have to bump that to next week. Instead, I'm doing something a little different - reviewing ABC's musical fairytale comedy Galavant. 'Galavant' is the tale of a former Hero (Joshua Sasse), with a capital H. He's used to slaying dragons and rescuing fair maidens in distress - until the love of his life Madalena (Mallory Jansen) ditches true love for fame and fortune by accepting the hand of King Richard (Timothy Omundson). A year after the wedding, Princess Isabella Lucia Maria Elizabett (Karen David) seeks out Galavant to help her overthrow a king, who has taken her kingdom of Valencia captive. His reaction? Until, of course, he finds out that it's King Richard he'd be going up against. Onward! Except, er, the good Princess of Valencia is lying about pretty much everything, and this is all a sinister plot to get Galavant in front of King Richard so he can kill him once and for all. Oh, and it's a MUSICAL! Okay. I back-and-forthed with my best friend while watching the episodes 1 and 2 (the only aired episodes thus far), discussing our feelings on it. After all, we've been looking forward to the show for months now. Unfortunately, on a scale of one (Holy Moly, can't live without it!) and ten (worst. thing. ever) I have to give it a seven. And only because of Timothy Omundson, who, as always, is perfection. 1. King Richard. He delivers every line with perfection, and is almost always delightfully unexpected with his reactions to things. He hails back to his days as Lassie on Psych, and has none of the seriousness he did in, say, his stints in Jericho or Supernatural. He is comedic gold, and I'm not just talking about his crown. 2. Gareth and the cook. Hulking he-man Gareth, the King's right-hand man, and the tiny, timid cook make an unexpectedly funny duo as they try to help the King win the heart of his demanding, annoying, demeaning wife. 1. ...it takes the slapstick humor and bawdy jokes beyond funny. As my partner in criticism said, "It's like they're hitting you over the head with a 2x4 saying 'AREN'T YOU JUST DYING OF HUMOR?'" When no, in fact, I'm not. Most of the 'humor' feels like they're trying way too hard to please kids and adults, and ending up losing on both fronts. The sexual innuendo means I wouldn't recommend it to youths and the dumbness means I wouldn't recommend it to adults. 2. Everyone else. Honestly, much of the acting here is pretty terrible. Princess Isabella Lucita Maria Elizabett might have been created to counterpart Galavant, but to date, she's had one line that was well-delivered, and it was more of a mumbled gesture than a line. Madalena is decent at her role, but not stunning. 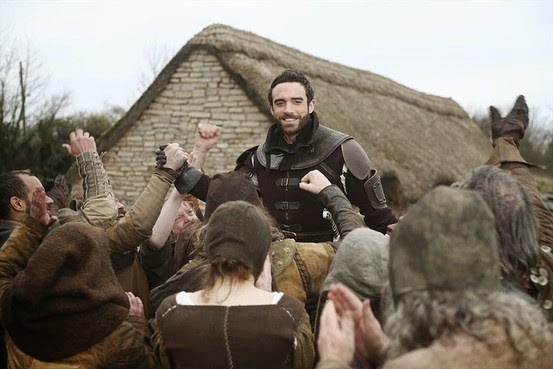 Galavant's squire is overly comedic and ends up falling short of funny. 3. It's predictable. Everyone knew that the Princess of Valencia would fall for Galavant, and that Galavant would fall for the Princess of Valencia. This show was meant to be funny without making you think, and it does a great job on one of those. (Hint: It isn't the funny part.) I mean, why? I'm usually happy with Alan Menkin's music. I mean, the man is a Disney legend. His scores are ordinarily perfect, catchy, and awesome. Instead, there were only two songs here that stuck out to me, and they were both in episode two. The first song I enjoyed was the 'Hero' song at the beginning of the second episode, and the second song was King Richard and Madalena's duet at the end of the episode. Other than that, the music and the score fell short of Menkin's usual pizzazz. It's trying to be Monty Python and the Holy Grail meets the Princess Bride meets Knight's Tale. And it's failing really badly. If I continue watching, it will be for King Richard, and maybe Galavant. Everything else is second-fiddle (or maybe third, possibly fourth). Let me just say, I'm glad the episodes are only twenty minutes long or I would give up on it entirely. Can we just turn the show into a story about the loopy King and his crazy Queen? That, I'd watch. Ah, that's too bad. This one had definitely earned my curiosity, but I'm not really big on even the best musicals--the Psych one was great, but that's about it. I may still end up turning it on in the background and checking it out for Lassie's sake, though. Great review!